Rollins School of Public Health, Emory University, Atlanta, GA, USA. Fielding School of Public Health, The University of California, Los Angeles, Los Angeles, CA, USA. The American Mock World Health Organization (AMWHO) provides a platform for students to apply their knowledge of global health policy through simulations of the World Health Assembly (WHA). This model engages and empowers future global leaders in health policy while sharpening their skills in diplomacy, public speaking, and conflict resolution. The major theme for the AMWHO 2015 was Universal Health Coverage, reflecting what the WHA had discussed in preceding months. The American Mock World Health Organization (AMWHO) is a model for experiential-based learning and student engagement in global health diplomacy. AMWHO was established in 2014 at the University of North Carolina at Chapel Hill with a mission to engage students in health policy by providing a simulation of the World Health Assembly (WHA), the policy-forming body of the World Health Organization that sets norms and transforms the global health agenda. AMWHO conferences are designed to allow students to take their knowledge of global health beyond the classroom and practice their skills in diplomacy by assuming the role of WHA delegates throughout a 3-day weekend. Through the process of developing resolutions like those formed in the WHA, students have the unique opportunity to understand the complexities behind the conflict and compromise that ensues through the lens of a stakeholder. This article describes the structure of the first 2 AMWHO international conferences, analyzes survey results from attendees, and discusses the expansion of the organization into a multi-campus national network. The AMWHO 2014 and 2015 post-conference survey results found that 98% and 90% of participants considered the conference "good" or "better," respectively, and survey responses showed that participants considered the conference "influential" in their careers and indicated that it "allowed a paradigm shift not possible in class." In January 2014, founder and author Neha Acharya created the American Mock World Health Organization (AMWHO) at the University of North Carolina at Chapel Hill, based on the Ontario Model World Health Organization (OMWHO) in Toronto, Canada, an organization holding conferences that simulate the annual World Health Assembly (WHA) held in Geneva, Switzerland. Its sister structure, Model United Nations, replicates the United Nations General Assembly, and is widely popular in both high schools and universities throughout the world. Within the United States, few students have similar opportunities to sharpen skills and explore a future in health policy. Mock World Health Organization conferences fill that gap by engaging students in health diplomacy by replicating the WHA debating a particular, complex global health issue. Future global health leaders require a skill set in negotiating and forming policies with other global health players. Since the founding 2014 AMWHO conference, 2 international AMWHO conferences have been held. In this article, we describe the structure and procedures of the AMWHO conference and roles that students play while illustrating the content of the debate with a case study from the Americas region during the AMWHO 2015 conference. We also present findings from online surveys of AMWHO 2014 and 2015 participants to inform successes and opportunities for growth. During each 3-day mock WHO conference, delegates assume the role of either a WHO Member State Ambassador, an NGO representative, or a media correspondent. Most delegates represent WHO member states as they debate, strategize, and form resolutions. A handful of delegates represent NGOs and the media. Reflective of the role of NGOs in global health governance, resolutions proposed by WHO Member State delegates can only pass with approval from a majority of the NGO delegates. Representing the role of the media in global health governance, media correspondents move between committees to report on the proceedings of debate, often influencing the direction of discussion. 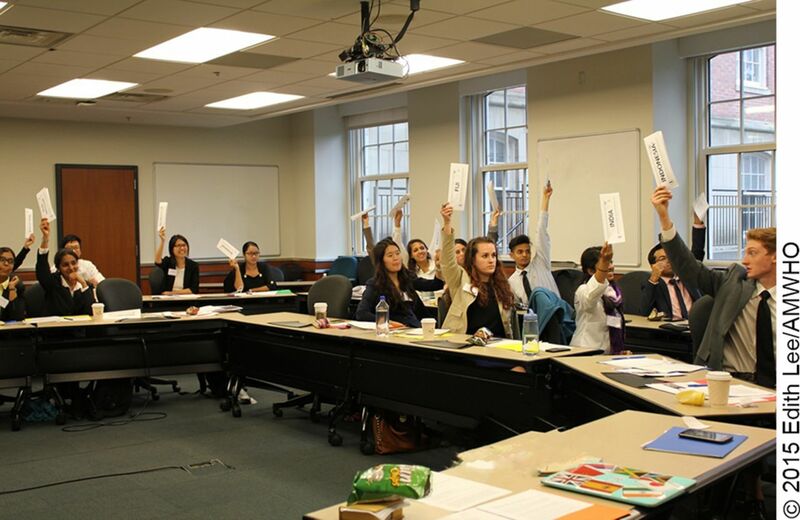 At the American Mock World Health Organization, student delegates assume the role of either a WHO Member State Ambassador, an NGO representative, or a media correspondent. Participants spend the first 2 days of the conference in committee sessions, where they debate how to best address the chosen theme, negotiate draft working resolutions, and gather support for their proposed plan of action. They spend the third day in plenary, where all regional committees convene to amend and finalize draft resolutions (Table 1). Subject matter experts provide insight into the theme at scheduled presentations throughout the conference. The conference ends with closing ceremonies, where awards are announced for Best Delegate and Best Position Paper from each region. Committee sessions comprise the majority of the first 2 days. During committee sessions, WHO Ambassador delegates convene in regional blocs based on the WHO regions: Africa (AFRO), the Americas (AMRO), Europe (EURO), Eastern Mediterranean (EMRO), South-East Asia (SEARO), and Western Pacific (WPRO). SEARO and WPRO are combined into 1 region for the conference to allow for a substantive amount of delegate representation in the region. Delegates in the South-East Asia (SEARO) and Western Pacific (WPRO) committee in moderated caucus. The students convene in regional blocs at committee sessions during the first 2 days of the conference. On Day 1, AMWHO conferences begin with a delegate training session to familiarize the students with parliamentary procedure and the overall conference. The first committee session follows shortly thereafter. Within this session, delegates present ideas on setting the resolution agenda to a narrower, region-specific subtheme of the main conference theme. All subsequent resolutions are written on the agenda topic, which is set by majority vote. After delegate training on Day 1, an opening ceremony features a subject matter expert who introduces the delegates to the conference theme. This speaker provides a framework and context for delegates to better understand and write their position paper on the topic of debate. Throughout the remaining days of the conference, 2 to 3 subject matter experts speak to provide insight from their fieldwork, research, and other experiences. See Table 2 for a list of speakers from the AMWHO 2014 and 2015 conferences. On Day 2, committee sessions continue, and delegates engage in discourse on the best solutions to the committee subtheme. Delegates address the entire committee in moderated caucuses and obtain consensus on their proposed plan of action. Delegates later enter into an unmoderated caucus for informal discussions that move toward drafting resolutions. Each region can form up to 2 resolutions. Between 1 and 3 Sponsors write the resolution and are responsible for seeing its passage. Signatories support the spirit of the resolution but may not fully agree with the entirety of the clauses. By the last committee session of Day 2, fully formed draft resolutions are submitted to the dais. At this time, delegates may amend each other's resolutions by adding or removing clauses, altering language, or adding specificity through sub-clauses. At the end of the day, each regional committee votes on all amended draft resolutions. If passed, the draft resolution goes to plenary on the last day for consideration by all member state representatives. Delegates from all regional blocs convene in plenary on the final day of the conference. Sponsors present an overview of each resolution, and the conference as a whole amends and votes on the regional resolutions. Those that pass plenary are sent to the World Health Organization in Geneva for review. Student delegates from all regional blocs convene in plenary on the final day of the conference. AMWHO recruited both undergraduate and graduate students through social media marketing, through the American Public Health Association, and emails to individual professors and to university listservs. Table 3 outlines the universities represented at both international conferences, as well as universities hosting regional or local conferences. AMWHO also received sponsorship from local and global health organizations. The AMWHO 2015 conference selected the theme of "Universal Health Coverage" to in alignment with a topic discussed by the WHA in the months preceding the conference. Table 4 describes the content of discussions and debates that occurred in each region during this conference, and the Box provides more details about the debate that emerged specifically from the AMRO region. The experience concluded at plenary, where AMRO's resolution was passed with the addition of a few amendments. See the Appendix for the AMRO resolution that resulted from the plenary. The theme of AMWHO 2015 was Universal Health Coverage. Over the 3-day conference, most participants were grouped into regional committees, based on the WHO regional offices. Some participants assumed the roles of NGO representatives or media correspondents. This case study of the Americas Region (AMRO) committee highlights illustrative examples of the experience of participants. Upon arrival, each delegate had identified the issues relevant to his/her particular country in the form of position papers. The first committee session began in a disjointed fashion when delegates were given their initial opportunity to speak as a wide variety of concerns were presented. Delegates aimed to clarify their agenda by agreeing upon key definitions. A comprehensive definition of vulnerable populations ultimately served as a pre-ambulatory clause to the resolution, which set the tone to recognize that each country has distinctive marginalized groups. Further discussion was also needed to define the intent of the phrase “equitable access to all” in the agenda; the delegates ultimately settled upon calling for child health care, primary care, and preventative care. Several countries advocated the inclusion of mental health in this definition, but it was not included. Once these goals were more clearly defined, debate turned to topics that structurally supported the chosen agenda subtheme. Many of the dominant topics not chosen as the subtheme were later addressed as subtopics in the agenda. The committee discussed the importance of health information systems, accounting for financial hardships, and expansion of health services into underserved regions. Health information systems were proposed to monitor outcomes and thus assess the success of various universal health coverage systems. Finances were tackled with a call for collaboration between countries on international issues as well as better coordination of existing funds within countries. Throughout debate, the delegates worked within the WHO's scope of power and avoided infringing upon any country's sovereignty. As delegates moved to unmoderated caucus to write resolution clauses, NGOs requested to modify clauses to maintain their influence but rejected any clause that would impose excessive responsibility upon them. Resolution sponsors then presented the draft resolutions for amendments and approval. Among various amendments that dealt with slight wording changes, AMRO voted to include the aforementioned clause concerning mental health, which was pivotal for some delegates whose votes were unsecured. Due to the dichotomy of wealth in the region, the committee did not pass a contentious amendment that acknowledged responsibility to donor countries. U.S. Ambassador Jimmy Kolker, keynote speaker to the AMWHO 2015 conference, also participated during the final AMRO committee session. Ambassador Kolker briefly represented the United States and offered a few amendments, including one that added lesbian, gay, bisexual, transgender, and queer/questioning (LGBTQ) to the definition of vulnerable populations, which passed unanimously. U.S. 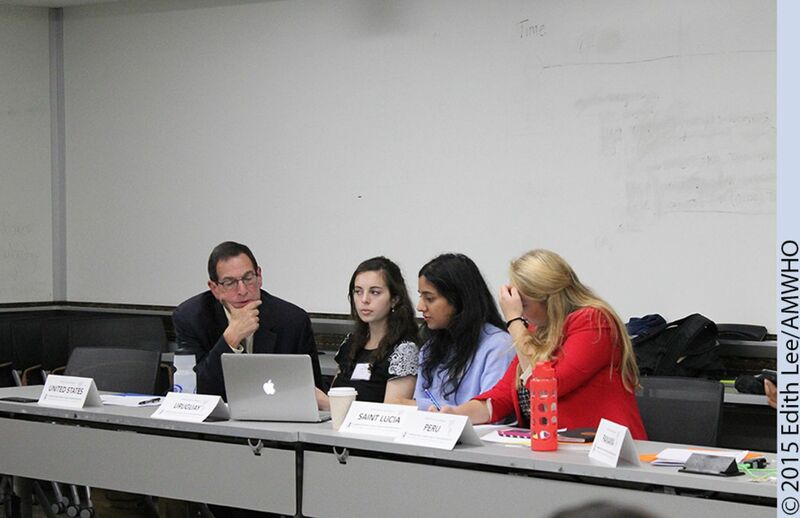 Ambassador Jimmy Kolker, Assistant Secretary for Global Affairs at the U.S. Department of Health and Human Services and the U.S. representative to the WHO, works with students on a resolution at the American Mock World Health Organization 2015 conference. In his keynote, U.S. Ambassador Kolker illuminated that it was out of character for a number of countries in the AMRO region to vote in favor of LGBTQ recognition and advised the delegates to be careful to accurately represent their country's official positions in this simulation of international debate. Similar to the resolutions of most regions, amendments proposed by countries of other regions during plenary were friendly and passed with little contention. The most substantive changes made included an amendment that removed a line requesting NGO collaboration in the WHO audit, which was recommended prior to implementing a universal health coverage system and an amendment to focus on evidence-based outcomes to determine universal health coverage success. Finally, a clause that provisioned for data protection throughout universal health coverage was added. In total, 124 and 113 attendees from around the world registered for the AMWHO 2014 and 2015 conferences, respectively. At the conclusion of each conference, we conducted an anonymous online survey of delegates to seek feedback on their experience, with 50 responses (40.3% response rate) following the 2014 conference and 39 responses (34.5% response rate) following the 2015 conference. Attendee feedback after each conference is used to inform successes and opportunities for growth in moving this nascent organization forward. The vast majority (98%) of respondents from the AMWHO 2014 conference indicated the conference as being "good" or "better", and 90% of respondents indicated they would recommend the conference to a friend. Similarly, the majority (90%) of respondents from the AMWHO 2015 conference rated the experience as "good" or "better", and 97% indicated they would recommend AMWHO to a friend. The vast majority of conference survey respondents rated the conference "good" or "better" and said they would recommend it to a friend. Survey respondents were also asked to summarize their AMWHO experiences. Table 5 presents some of the open-ended feedback received from respondents according to the objectives that AMWHO seeks to realize. For example, respondents indicated AMWHO provided opportunities to gain practical experience in formulating global health policy that is not possible in a classroom environment. Other respondents pointed to AMWHO's ability to allow participants to think from the perspective of policy makers and other stakeholders. In addition, the International Federation of Medical Students' Associations (IFMSA) contact at WHO headquarters indicated that the AMWHO 2014 resolutions were succinct and practical and that only a few amendments exceeded the limitations of the WHO; as a whole, the IFMSA contact indicated the resolutions were similar in style, content, and urgency as those created in the WHA. AMWHO will receive feedback on the 2015 conference by March 2017. Two major challenges identified in the AMWHO 2014 conference were the plenary structure and the desire for professional development opportunities. The AMWHO 2015 conference provided an opportunity to grow and address these challenges to improve participants' experience. Many participants found the AMWHO 2014 plenary session to be less engaging and productive than the regional bloc sessions. In response, the dais of AMWHO 2015 received additional training to enable them to better facilitate debate, and we imposed time limits for the plenary debate of each resolution. We also placed limits on the number of resolutions each regional bloc could submit to plenary. The 2015 feedback showed that while plenary improved, there is still room for improvement in delegate engagement during plenary debate. Based on 2014 feedback, AMWHO 2015 expanded its professional development and networking opportunities. As a direct result, we hosted the "Lunch and Learn" event on Day 2, during which professionals from a variety of fields and sectors, e.g., business, education, and academia, were invited to eat with students and discuss their careers, paths, and interests. Another purpose of the "Lunch and Learn" event was to expose students to the various fields necessary to realize global health equity. Based on survey responses, the "Lunch and Learn" event was very popular among participants as a professional development tool. Additional networking opportunities included a "Delegate Social" held on Day 1. AMWHO fills a gap in global health policy education by providing students with exposure to the mechanics and political dynamics of the World Health Assembly, and an experiential opportunity to develop skills essential to careers in global health governance. After 3 international conferences, AMWHO has developed an effective structure, with post-conference survey results indicating that AMWHO fulfills its objectives. The American Mock World Health Organization fills a gap in global health policy education by providing students with the opportunity to develop skills essential to careers in global health governance. Since the creation of the conferences, AMWHO has sought to sustain its experiential education efforts by creating university chapters that engage in mock debate and that host regional conferences throughout the year (Table 3). This has filled an unmet need on campuses with growth from 5 to 12 chapters in 2016 alone. AMWHO is working toward a future as a registered nonprofit that is in all high school and collegiate institutions in the United States, similar to Model United Nations. As AMWHO grows in scope, its purpose remains to develop, improve, and expand our capacity to create a generation of students who understand the complexities of diplomacy and policymaking. With continued growth, the organization has potential to contribute to developing a cadre of learned, well-trained, and capable global health practitioners for years to come. Special thanks to the AMWHO 2014 team, the AMWHO 2015 team, and AMWHO mentors Dr. Benjamin Mason Meier and Dr. James Herrington. The Triangle Global Health Consortium, the Gillings School of Global Public Health, RTI International, the UNC Department of Health Policy and Management, the UNC Department of Public Policy, the Gillings Global Gateway, the Duke Global Health Institute, and UNC Student Government all provided funding for the AMWHO 2015 conference. The authors received no funding to write this field report. Encourages better targeting and coordination of existing funds to address international issues, including but not limited to migrant populations, disease epidemics, international information databases, and assistance to countries in need with regards to individual universal healthcare coverage systems. Calls to be accomplished via the building of human capital of local individuals from communities and local indigenous groups. This will ensure sustainability, cultural relevancy, and trust from locals of health workers.
. What is ‘global health diplomacy'? A conceptual review. Glob Health Gov. 2011;5(1). http://blogs.shu.edu/ghg/files/2011/11/Lee-and-Smith_What-is-Global-Health-Diplomacy_Fall-2011.pdf. Accessed February 26, 2017.